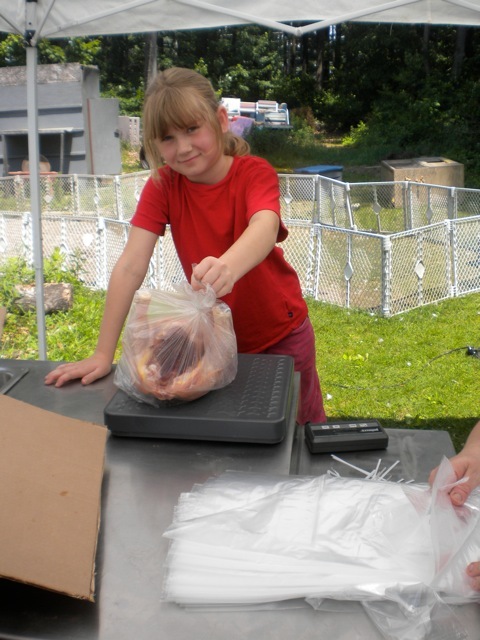 By Community Chickens on January 2, 2012 Visit Community's Website. Processing day actually starts the day we bring home our day-old meat chicks from the feed store. Being Cornish Cross or Jumbo Cornish Cross means we only have a scant eight weeks to prepare. The very first thing we do after the little chicks are under the heat lamp and fed is to mark the calendar eight weeks out. 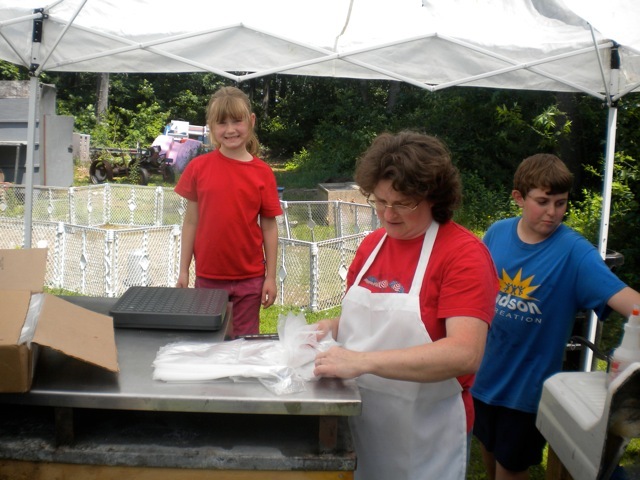 The first time we did our own processing we didn’t look ahead and we ended up scrambling for a plucker on Memorial Day weekend! Since our first time out, we’ve gotten our own plucker, but if we need to have another one on hand, now is the time I would start scouting around for a rental and put money down on the date. Giant aluminum scalding pot with heavy duty propane burner. It’s a good idea to have everything one needs for processing ahead of time … once you start you can’t stop. I take those eight short weeks for grow out to gather all the items. I think ahead not only about the plucker, but about the water source, sinks, scalding and burners, clean tables, cooling, packing, and disposal of the offal, along with good sharp knives and aprons. I think the process through step by step, from the moment we take the bird from the coop until the moment we pop it into the freezer. Don’t want to be running to the store for ice in a bloody apron! Set up with coolers, freezer, stainless steel tables, outdoor sink in background. 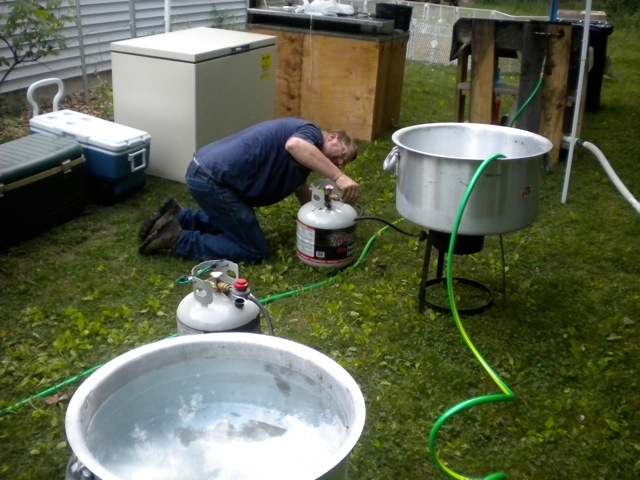 Foreground is double scalding pots. The Friday before the big day, food is withheld from the meat birds. It’s a hard thing, as the Cornish X meat birds are endlessly hungry. Also on Friday evening we set up one or two EZ-up canopies out in the way back of the yard. We drag out the stainless steel counters we fashioned from scrap and added wooden legs. Next comes the old-fashioned farmers sink, you know the kind: heavy porcelain-coated cast iron with a drain board built in on one side. Hubby added a wooden base to that as well and also installed a faucet and drain pipes. It’s mighty heavy to move around, but its smooth porcelain surface is a breeze to clean up and disinfect. While hubby is setting up the cones and getting the plucker in place, my job is to clean and disinfect all the surfaces. I use a solution of bleach and water with a touch of dish soap in a spray bottle to scrub up the stainless steel tables, holding tubs, sinks, knives, etc. We keep it on hand to periodically clean up as we go, and we’ll use it again at the end. We have learned over several processing events that we are each suited to particular jobs. I, for one, cannot do the following: slaughter, scald, plucking. But read on, my time will come. Hubby does the slaughter. 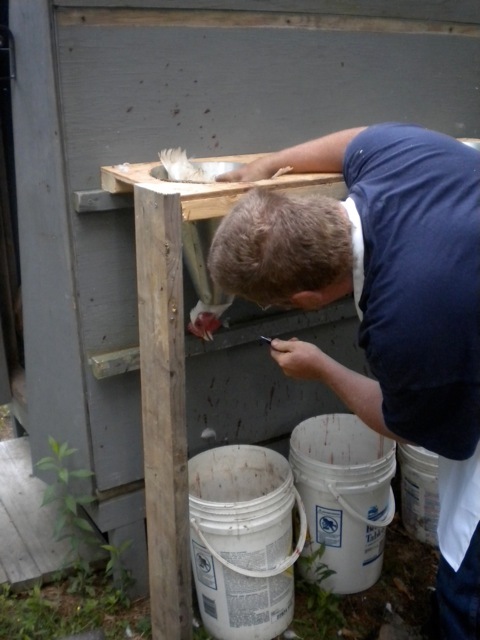 He’s got a small shelf attached to a back shed that holds three cones with buckets under each one to catch the blood. We also have a tarp on the side of the shed that reaches to the ground, so we can use the hose or pressure washer to clean up more easily. Once he’s done, the bird moves to the scalder, which is usually the job of my son. After trial and error, he’s got it down to a science! We actually get two pots going, one to use for scalding and one to be heating up so that when the first one gets dirty we can switch. We also have an instant-read thermometer to keep a check on the water temp and a hose nearby to cool it off if it gets too warm. The only real way to tell if you’ve got the temp correct is to pluck a few. If the skin tears too easily, the water is too hot. If the feathers aren’t coming out, the water is too cold. Scalding pot ready to switch with the clean water one. Our ancient rotary drum style plucker with tarp to catch the flying feathers. I gather up my courage and remove the feet. Using kitchen shears to remove the neck saves time and effort over a knife. After scald, the next station in the line is the plucker. Our good friend has taken a shine to running the plucker. He’s become a plucker master. Of course, our plucker is as old as the hills. A rusty pile of metal with a rotating drum … on the outside. We got it for a steal at $50, but of course, we’ve had to add all new fingers. It takes a whopping 400 fingers! At a buck a finger, you can see how that adds up. My job is finally here. 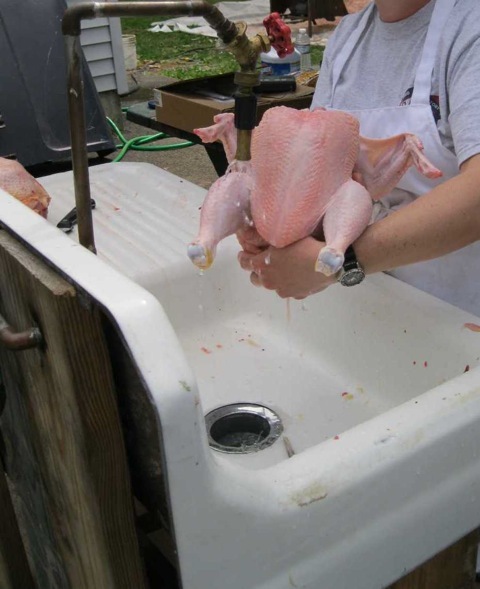 After the plucking, the bird is held over in a large plastic tub filled with ice and water. I take the birds from their cold water bath to begin eviscerating. Oh, and I’m squeamish about taking off the neck and legs, too. But, after a few hundred chickens, I can manage the task. We have an electric knife sharpener on hand, and buckets under the stainless steel table to catch the offal. The final rinsing and scrubbing in the old farmer’s sink. We keep several stainless steel bowls on the table, one each for innards that are being saved. Our family does not like any of the organ meats, so they are saved for friends who request them. Chicken feet go to our local Chinese food restaurant. They don’t serve them to their customers, but it’s a great delicacy for themselves. The offal is either given to a local hunter or double bagged and sent with the trash. Cleanliness and disposal of the offal, blood and feathers is very important. Any speck leftover for the next day brings flies. Thousands, and thousands of flies. 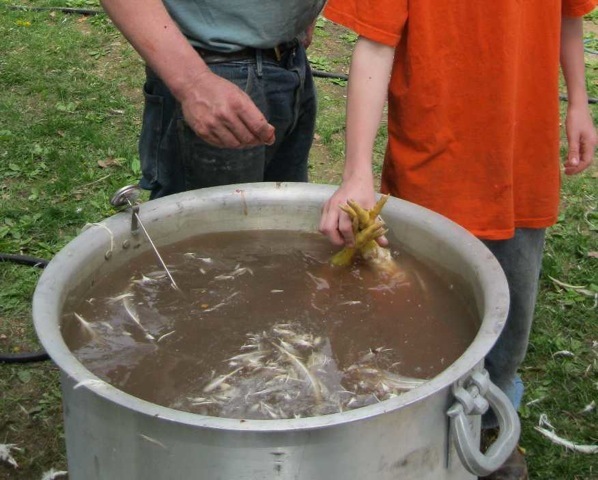 That first time processing, we were so tired, we forgot to wash out the slaughter buckets. BIG, BIG, MISTAKE … FLIES EVERYWHERE. Ahhhh, such a beauty … I mean the chicken. The bird moves from the eviscerating table to the sink. It’s washed thoroughly and any unwanted fat and bits are removed. 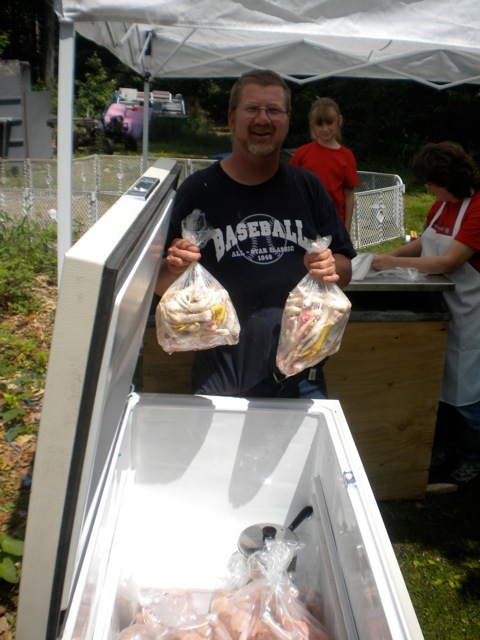 The birds are then put into coolers filled with ice until all the birds are done. Hubby is the first one done with his station and by then there is usually a backlog at the eviscerating table. His job moves from slaughter to hose. He cleans up his area before blood starts to coagulate and adhere to surfaces. My son, the scalder, is next to be done, and he moves into clean up mode as well. He dumps out the pots and washes them down. Next up for cleaning is the plucker. We fashioned a tarp behind it to catch all the feathers (remember, it’s the drum style). The tarps are hosed down and feathers raked up and bagged. A tub plucker shoots them out the side, which can be easily raked and bagged. Daughter Paige, weighing up the birds. The baby gates in the background are where the chickens spent their eight weeks. Meanwhile, I am still trying to catch up with eviscerating. By now, all the other stations are helping me. 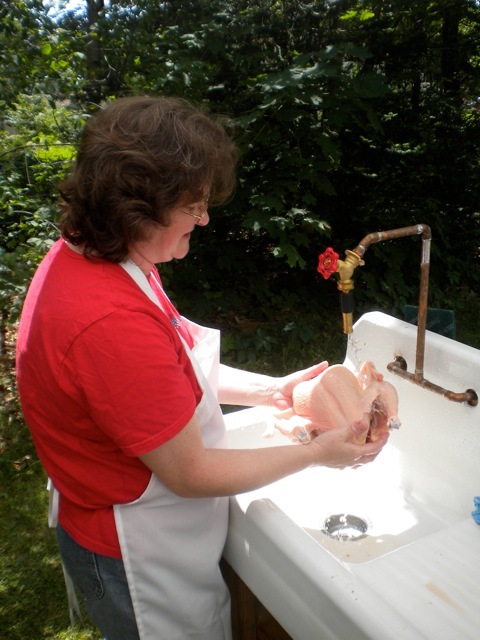 This is the most time-consuming part, particularly washing the birds. Once all the birds are in the cooler, it’s my turn to clean up the knives, tables, sink and buckets. When it’s all clean, the birds are taken out of the cooler and bagged. We like to weigh our birds to check on feed conversions and wow over how much bigger our good friend’s birds are … eergh. We clean out the coolers and change over to new ice. They can remain in the ice coolers until the next day, which is good, because we are all pooped! The next day, besides being incredibly stiff and tired, we take down the canopies and tarps, drag back the table and sink, and hang up the scalding pots. I like to part out the birds, so that I don’t just have a freezer full of whole roasts. I divvy up the carcasses into breasts, legs, thighs and wings. I even bag up the carcasses to make stock. The bags are marked and put into the freezer. Done. Good thing we took Sunday to rest, eh? Getting ready for the final push. Bagging and weighing. For some reason, hubby was thrilled with the feet. Our birds finished and ready for the freezer. This is so cool! We have just started raising chickens. We are doing it for the meat and eggs. (Who knew it would be so fun and fulfilling?) We were going to have a friend of ours who is an avid hunter help us, but not any more. Thank you so much for taking the time to map it out like you have. Also, I learned quite a bit more just from taking the time to read the comments. I am really looking forward to following your blog. Just out of curiosity, what state do you live in? Why are your freinds chickens larger? Totally agree with Rachel! Love homemade stock and would love to have what Red Barn Meadows calls “the rest” that she tosses after the breast, legs, and wings. Homemade stock is so nutritious and nourishing! All of the blood is pressured washed into the ground. The feathers are bagged and trashed and some are composted, all the offal is given to a local hunter for bait. Yes, most meats benefit from a resting period. 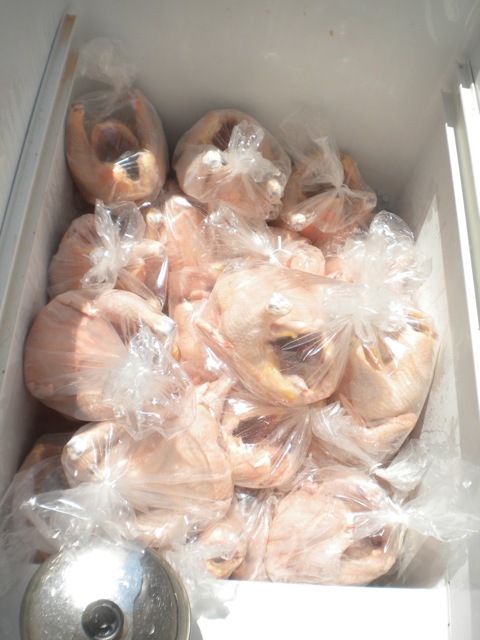 Chickens are no exception, we keep ours in the fridge about 3-4 days before they go into the freezer. Somewhere I heard Europeans age poultry 21 days??? I would like to find out if that is true! We leave the skin on, it’s purely a matter of choice. I think my roasts benefit from having the skin in tact to hold the cooking juices. We usually end up with one or two without skin, but usually it’s an OOPS! factor. 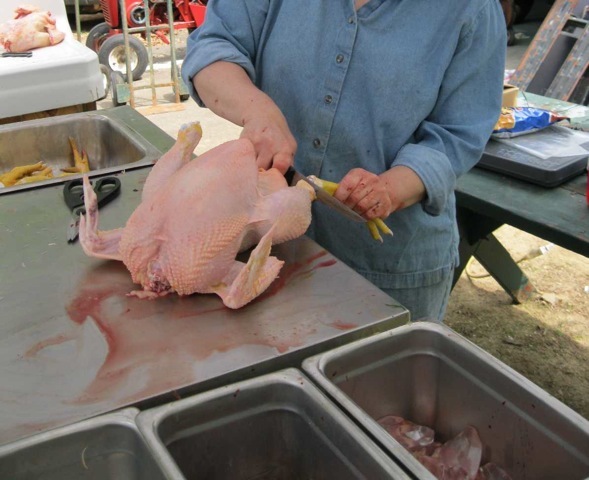 Sometimes it takes a few of the first birds done to get the “hang-of-it” again and a few get too much scalding–plucking after too long or too hot a scald and the plucker goes wild and takes off the skin too! We have a friend that takes the guts for hunting bait, and the feet go to a friend at the Chinese food restaurant. We don’t like the offal, so we give the liver, hearts, kidneys and gizzards to anyone who would like them. No waste here! In fact, at our recent turkey processing this past Thanksgiving, a friend took the feathers, washed them and fluffed them in the dryer and made some really gorgeous decorations. Who knew? 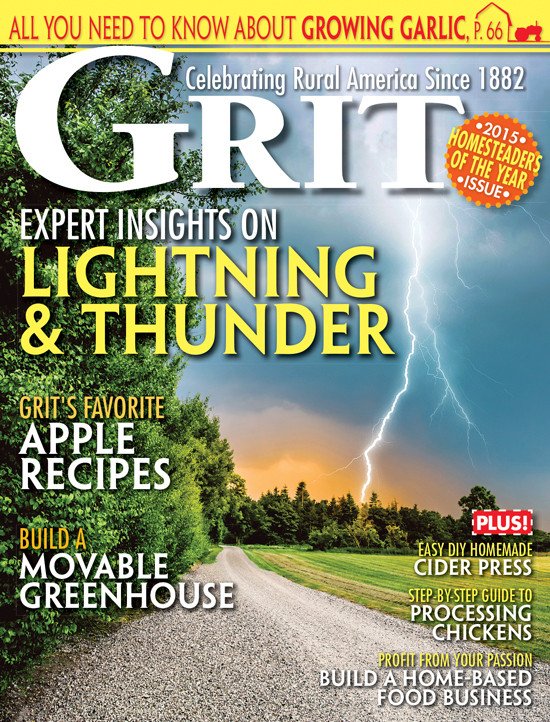 This is a great article – very informative. 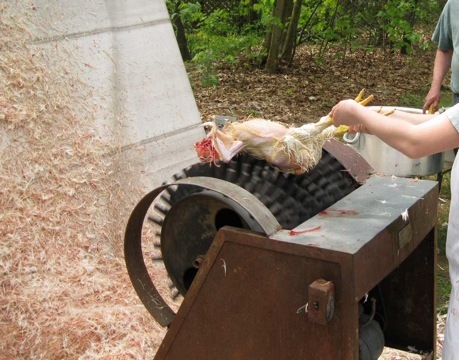 It also reinforces for me why we do something totally different: we skin our chickens. (Well, I’m giving myself too much credit; Todd skins them). He kills, skins, eviscerates, and then they go into cold water briefly or straight to rinse, bag and freeze (depending on whether I’m caught up). He does the skinning in a “T” pattern: leg to leg, and then up the breast. The skin comes off quite easily, and the process is amazingly quick. We don’t usually eat chicken skin anyway, so this just made sense to us. The meat is fantastic; we double bag and haven’t had trouble with it drying out in the freezer. I’ve roasted these birds and they are wonderful and moist. I’ve even fried them. We are sold on skipping the whole plucking thing, and I just wanted to pass this on to anyone else who might want to try something different (and loads easier). Excellent article. One time-saving tip I could add is that you can skip the eviscerating step for the ones you intend to part up. We don’t use many whole roasters in our house, so I usually just take the bird straight from the plucker, remove the feet, and then just take the legs, breasts, and wings and toss the rest. Easy peasy 🙂 It saves a ton of room in the freezer. And yes, Tracy W., I always age them in the fridge for 3-4 days before putting them in the freezer. I tried straight-to-freezer once and they were all a little bit tough and stringy. We are processing for the second time tomorrow – was wonderful reading your article to help us remember everything. I was told by a farmer that the chickens should be aged a few days before freezing. What can you tell me about that? Wow! How many do you do at a time? Is this a once a year project? Out of the day-olds you purchase, how many make it to harvest? Thanks so much for all this great information!